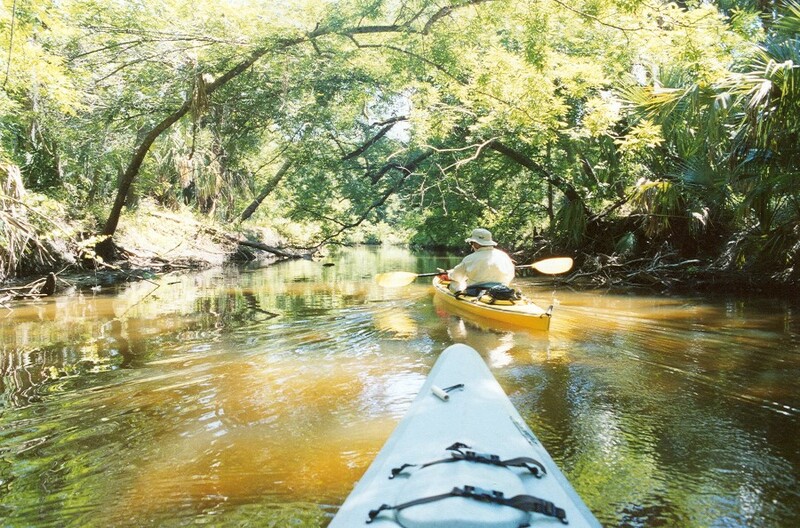 Now that I have paddled nearly all navigable waters in North Central Florida, I am increasingly finding that I must travel great distances to reach rivers I’ve not yet sampled. This weekend, a group of five of us have decided to set out for Sebastian Creek, a 4-hour drive south of us. Due to the distance, two of us set out the night before for Melbourne to sleep at a US 1 motel up the road from the put-in point for the south prong. We wake to a bright, sunny, cloudless day. As early risers, two of us walk the old downtown Melbourne while waiting for the others. Downtown is rather small. Two streets with on-street parking, some streetscaping, and small shops. At busy times of day, this vicinity is probably a somewhat pleasant place to stroll and hang out. After walking the streets, we stop at Mr. Beau Jeans, a very nice restaurant serving excellent breakfasts in their outdoor patio graced by borders and canopies of striking red bougainvilleas. I order their fruit-topped Belgian Waffles, for which they are said to be known for. A good way to start the upcoming paddle. We decide we will put in upstream on the South Prong of Sebastian Creek and have shuttle vehicles await us at the public park downstream a few miles. Put in at the Rt 512 bridge is possible, but not the most pleasant experience. We carefully carry our kayaks along a narrow road shoulder cluttered with typical American roadside litter, walking within inches of high-speed, high volume car traffic. The narrow path leads us under a bridge without a lot of head room, but comfortable enough for us to slip our boats in the water. The upstream portion of the South Prong averages about 15 to 30 feet in width. Not a bad width for kayaking. While there are short snippets of overhanging canopy trees one paddles under, we find that most of the South Prong is flanked by grasses and bamboo. Not much to write home about or otherwise enjoy. The water is a murky brown color. Fertilizer run-off from the nearby subdivision, perhaps? Despite these minor flaws, the South Prong, more so than any other body of water I have paddled, is literally teaming with aquatic life. Flying mullet are constant throughout the paddle. We see the usual Florida river collection of large turtles and basking alligators (one of which entered the water and appeared to be on a torpedo course for our boats when we came near). Along the way, we spot more than a few relatively large crab in the water. Most astonishing of all, however, was the ENORMOUS population of quite large gar fish we see. During the paddle, I spot at least 45 of these monster fish with long and tiny snouts. We break for lunch on a small, cleared peninsula, and while eating we hear a loud, unusual blowing sound behind us. "What on EARTH is making THAT sound??? ", we ask. Turning around, we spot the source. Ten feet from us, a large manatee is surfacing and blowing water to catch a breath of air. Reaching the public park near the end of the South Prong, we stop for a break. We have sufficient daylight time remaining, so some of us decide to continue on to investigate the North Prong of the Sebastian. From the park, it is a physically demanding and mostly unrewarding 90-minute paddle along a river that becomes more like a wide bay. The open nature of this portion of Sebastian whips up fairly strong winds, which adds to the paddling difficulty. Larger boats are found here, and there are several islands, river cul de sacs, and river dead ends (prongs?) on each side of us, making for a rather maze-like navigational challenge. A number of times, we must do some guessing to decide which course to follow to stay on the main channel. Two of us remain as we reach what we believe (based on our guide books) is the entrance to the North Prong, which is touted to be a very attractive route enveloped by a canopy of trees. But after a brief paddle upstream from the mouth into the larger Sebastian paddle, we see only high sandy bluffs without much in the way of tree canopy. We decide to turn back and consider possibly returning in the future (from a put-in that is closer, if possible, to the North Prong than is the public park). After all, we are not certain that we are in the narrow section of the North Prong we are seeking, and we are too exhausted to risk heading a long way upstream in what might turn out to be a dead end.